We’re flying to a new destination! Our simulator lands in our new destination at Reel Cinemas, Dubai Mall this May. Until then, we’re temporarily grounded. You can book your flight experience starting from May. Experience the thrill and challenge of piloting the world's largest passenger aircraft when you buckle up, take the controls and soar in our state-of-the art flight simulator at Dubai Mall. Choose your destination from thousands of busy airports and select from a range of different flight paths. Test your abilities against your family and friends! Pick your preferred flight time and weather conditions, then watch on high-definition screens as you circle above the Eiffel Tower, soar over New York or approach Hong Kong's incredible skyline by night. Choose from 15, 30 or 60 minutes. Check out the Emirates Official Store online. 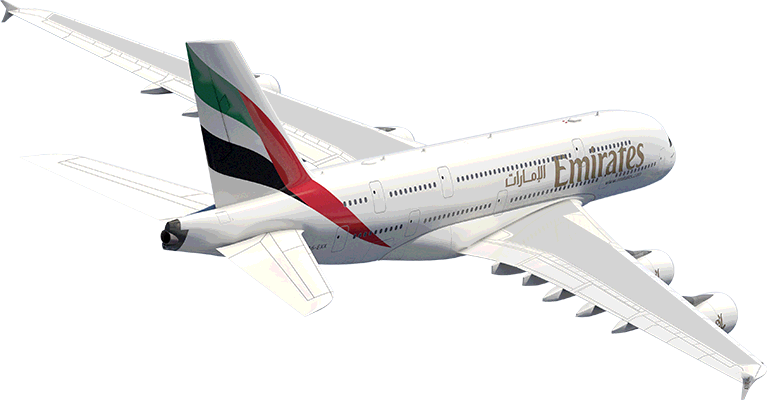 We stock an extensive range of official Emirates-branded merchandise including clothing, bags, toys, travel accessories and a 1:100 scale model of the A380 Airbus. Think you can take the pilots seat? Book your own Emirates A380 Experience today. 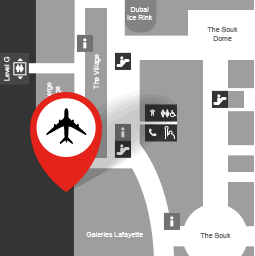 Book your A380 flight simulation experience today and receive a 10% discount at the Emirates Official Store. Our branded merchandise includes clothing, bags, travel accessories and a 1:100 scale model of the A380 as a reminder of your flight!